When the final credits ended, there were just two of us in the theatre and we ended up leaving together. “So, what did you think of the movie?” he asked me. “It was OK,” I said, “pretty violent and, at times, a little slow.” “Yeah,” he said, “and stupid. 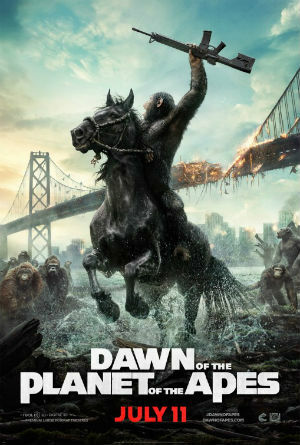 I thought it was really stupid.” Actually, the movie is simple, with lots of tenderness on the part of apes, who are at times, more humane than the humans. For me, the battle sequences went on too long and were too chaotically and persistently violent, with lead characters who were well-matched but too predictable. We know where this is going and what’s going to happen as soon as we meet them. And yet, this movie is entertaining on several levels. The motion capture work used to create the apes is really seamless, the evocation of a dystopian society struggling to survive is convincing, the parallels between this story and the violence that is going on in so much of the world are direct and frightening. And although the director Matt Reeves is relatively new at this game, he maintains a nice balance between the time we spend with the apes, and the time we spend with the humans. As we come to know each species, we respect the apes more – but apes firing guns at people – and people firing guns at apes – makes as much sense in the movies as it does in life. And when the violence stops – “pauses” is a better word – the story is filled with too many clichés. Still, if you like this series, you may like this movie best of all. But if you are just looking for entertainment, this never rises above a typical summer movie – long, long, with lots of impressive special effects. But it’s not stupid.